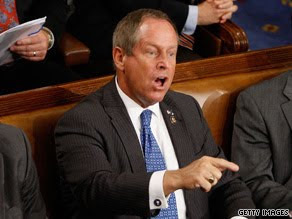 Republican Rep. Joe Wilson's "You lie!" outburst during President Barack Obama's speech before Congress nearly two weeks ago continues to have rippling effects. Wilson, who represents my home state of South Carolina, has pretty much been basking in his newfound limelight and has reportedly raised upwards of $2 million for his campaign since he heckled the president. But he could also be costing the Palmetto State money, and one of the latest moves will benefit Charlotte. The National Newspaper Publishers Association (NNPA), also known as the Black Press of America, has decided to move its 2010 convention from Charleston, S.C., and now plans to hold it in Charlotte. The nearly 70-year-old organization is made up of more than 200 black community newspapers from across the United States. South Carolina can't afford to lose conventions, which are instrumental to the multi-billion dollar tourism industry, that creates jobs and generates millions in tax revenue. Also, it should be noted, the NAACP has had a now 10-year economic boycott on South Carolina because of the state's refusal to remove the Confederate flag from the statehouse grounds. I was a student at the University of South Carolina, which is in Columbia where the campus sits less than a mile from the statehouse, when all of the ugly debating and protesting was going on over the Confederate flag. In what was supposed to be a compromise, in 2000 the flag was removed from atop the capitol building (yes, it used to fly atop the dome along with the U.S. flag and S.C. flag) and placed near a Civil War monument that's in the front yard. Many blacks said they wouldn't be happy until the flag was removed completely and placed at a more appropriate place like a museum. "Rep. Wilson’s remarks were racist, disrespectful, and a disingenuous violation--not only of President Obama--but to the institution of the presidency and only solidified our position and the importance in not spending black dollars where black people are not respected. The continued public and blatant disrespect of President Barack Obama by members of Congress will not be rewarded with our dollars nor will a state that continues to uphold America’s shameful past by flying the Confederate flag."